Picture the scene. 1987. Faded jeans, untidy haircuts, Computer Science undergrads all assembled (pardon the pun) in a lecture hall. “Today gang,” said our lecturer, “we’ll start with the basics – COBOL”. One of my first assignments was to pick up and learn one of a broad range of computer languages. So I was told, COBOL was picked first because it was a “good place to start as it’s easy to learn”. Designed for business users with straightforward syntax, it was a great place to start and my relationship with COBOL. Three decades later for me, the best language for business remains clear to those in the know. And, alongside its bedfellow the IBM mainframe, the best big-business platform, COBOL remains the tried and trusted backbone of some of the world’s most successful organizations. Little did I know back in 1987 that I was using a technology that had been conceived 30 years beforehand. Staggeringly, in 2019, one of the greatest technology inventions of the last century, the COBOL computer programming language, will celebrate its diamond anniversary. British monarchs aside, very little from the 20th century has stood the test of time quite so well. Much is said about the geniuses who shaped the tech industry. Yet the celebrated, windswept technology pioneers of Jobs, Turing, Bernars-Lee, Gates and Torvalds were not even in the room, let alone out of diapers in some cases, when this idea first germinated. A committee of US Government and industry experts had assembled to discuss the matter of computer programming for the masses, a concept they felt without which would halt the progress of technological advancement. Step forward the precocious talent of Grace Murray. On the Codasyl committee during the late 50s, she put forward the notion of a programming language that was “English-like” and which “anyone could read”, which was then formally added to the requirements. Her insistent push for how portability could be achieved was also the basis for what became the concept of cross-platform portability, still an inherent characteristic of the COBOL language today. Everyone can do it? Common. Designed with commerce in mind? Business Oriented. A way of operating the computer? Language. Remember, it was 1959. To provide some context that was the year during which rationing was still in force in the UK, and 5 years before the first IBM mainframe computer had been first released. Bill Haley was still rockin’ ‘til broad daylight, or so the contemporary tune said. Coining the phrase, which I will paraphrase rather than misquote, that it is sometimes easier to seek forgiveness than permission. I can only speculate that the inventors of “seize the day” and “just do it” would have been impressed with the notion. Her pioneering spirit and organizational skills ensured she delivered on many of her ideas. Characterising time using a visual aid: she invited people to conceptualize the speed of sound by how far electricity would travel in a nanosecond. She offered people a small stick, which she labelled a “nanosecond” – which you can see her describe in this video. 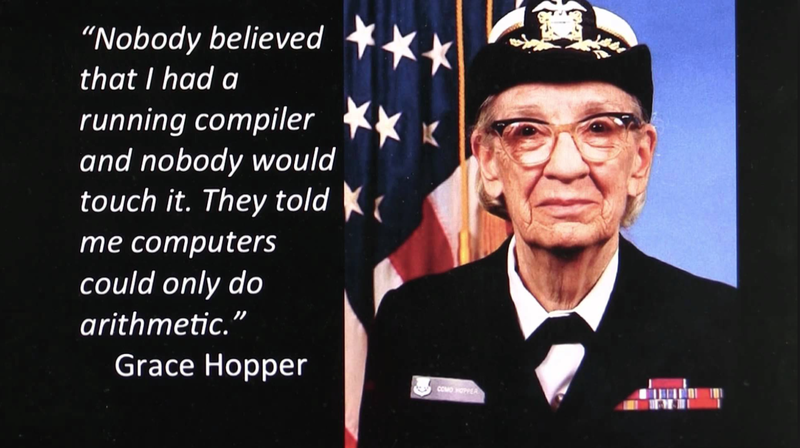 Later rising to the rank of rear Admiral, and employed by the Navy until she was 79, Hopper is however best known for being the guiding hand behind COBOL, a project that eventually concluded in 1959 and found commercial breakthroughs a few years later. Within a decade, the world’s largest (and richest) organisations had invested in mainframe-hosted COBOL Data Processing systems. Many of them have kept the concept today, though most of the systems themselves (machinery, language usage, storage, interfaces etc.) have changed almost beyond recognition. However, mainframes and COBOL are still running most of the world’s biggest banks, insurers, government departments, plus significant numbers of healthcare, manufacturing, transportation and even retail systems. Hopper died in 1992 at the age of 85. In 2016 Hopper posthumously received the Presidential Medal of Freedom from Barack Obama. In February 2017, Yale University announced it would rename one of its colleges in Hopper’s honour. The environment provided was something called COBOL/2, a PC-based COBOL development system. The vendor was Micro Focus. Other products were, and are, available. Next Next post: Back to the Future, Mainframe I/O and the Need for Speed!